Monday night’s region tournament action featured three DCSD girls’ basketball teams clinching state tournament berths with victories on Monday night. The Cedar Grove Lady Saints, Redan Lady Raiders and Druid Hills Lady Red Devils all won to earn state tournament berths. The Dunwoody Lady Wildcats, Lakeside Vikings and Tucker Lady Tigers all advanced one step closer with their wins on Monday. 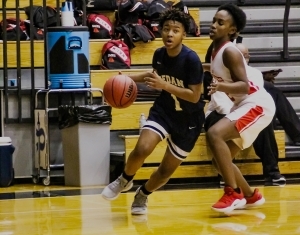 The Redan Lady Raiders (6-13) pulled off a 49-47 overtime upset victory over the DeKalb rivals Stone Mountain Lady Pirates (12-13) in the Region 5-3A Tournament opener at Pace Academy. Redan junior Daisha Twiggs had a big night including the go-ahead three-pointer with 48 seconds left in overtime for a 48-47 Lady Raiders lead. She then hit one of two free throws with 25 seconds to play to make it a 49-47 advantage. An offensive rebound and shot by Stone Mountain bounced off the rim at the buzzer as Redan held on for the big win. Coach Charlyce Henderson led the Lady Raiders to a state playoff berth in her first season and the first for Redan since the 2017 season. Stone Mountain trailed 45-41 with 3:00 left on the clock following Twiggs fourth three of the nigh, but rallied to take a 47-45 lead spurred by a steal and layup by Cenia Flood. Jordyn Alexander hit a pair of free throws with 1:31 to play to knot the game at 45-45. Rakael Johnson’s layup with 1:02 to play gave Stone Mountain the 47-45 lead before Twiggs’ go-ahead three. Twiggs finished with 21 points on the night and Jayla Cook hit for 9 points and grabbed 7 rebounds. Alexander finished with an 18-point, 19-rebound double-double for Stone Mountain and Jada Price added 10 points. Redan advances to the girls’ semifinals against No. 1 seed Pace (16-7) at 7:00 pm on Wednesday. The No. 2 seeded Cedar Grove Lady Saints (12-9) 14-0 lead on the way to a 57-18 state playoff berth win over the Towers Lady Titans (2-18) in the nightcap at Pace on Monday. 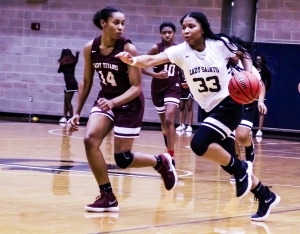 Cedar Grove scored just two points in the first 4:02 of the second quarter until Kaitlyn Hairston went on an 11-0 run by herself as the Lady Saints began to put more distance between themselves and Towers. Hairston hit a pull up jumper and then hit three long three-pointers to extend the lead to 27-5. Rickayla Johnson hit for 12 second half points as Cedar Grove cruised into the semifinals with the 57-18 win. Hairston finished with a game-high 13 points to lead Cedar Grove. Johnson added 12 more and Antoniya Hicks reached double figures with 10. Catherine Forbes had 8 points and 6 rebounds to lead Towers in the season ending loss. Cedar Grove advances to take on Lovett (16-8), 62-29 winners over Westminster in the 4:00 pm girls’ semifinal at Pace on Wednesday. It had been 18 seasons since the Druid Hills Lady Red Devils had been to the state playoff, but the streak ended with a 42-40 win over host North Clayton on Monday. Druid Hills and North Clayton were tied 40-40 with 50 seconds to play. Druid Hills score two to take a 42-40 lead. North Clayton, the No. 3 seed, had one last chance with 3 seconds to play throwing the ball in under the Druid Hills goal. A long pass down court was tipped by Druid Hills and a last shot was way wide on a desperate turn and throw that allowed Druid Hills to earn its first state playoff trip since the 2001 season. It is the 15th overall including the 1960 Class 3A state title. Two Class 6A girls’ teams won to move a step closer to the state tournament. Dunwoody knocked off Chattahoochee 50-32 and faces John’s Creek at 6:00 pm on Tuesday at Pope with a state playoff berth on the line. The Wildcats were not as fortunate as they fell 72-37 to John’s Creek to wrap up their season. The Tucker Lady Tigers (6-19) advanced in the Region 4-6A girls’ tournament with a 49-46 win over Morrow (1-22) at Stephenson. Tucker advances to face No. 1 seed Lovejoy (22-3) in a 7:00 pm contest at Stephenson. The Lakeside Vikings (9-17) advanced to Tuesday night’s matchup with No. 3 seed Berkmar (17-7) at 4:30 via a 65-54 win over Central Gwinnett (4-20) on Monday at Meadowcreek. DeKalb had 14 teams playing for spots in their respective state tournaments on Tuesday night (see schedule below).